Emerica’s #wits start time and locations—spread the word if you can! The more attention this gets the better it is for Detroit and the skate scene there. 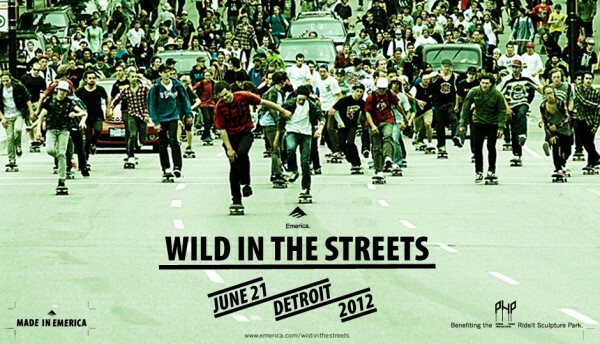 On Thursday June 21, 2012, join the Emerica team and thousands of skateboarders from around the globe for Emerica’s Wild in the Streets in Detroit, Michigan. 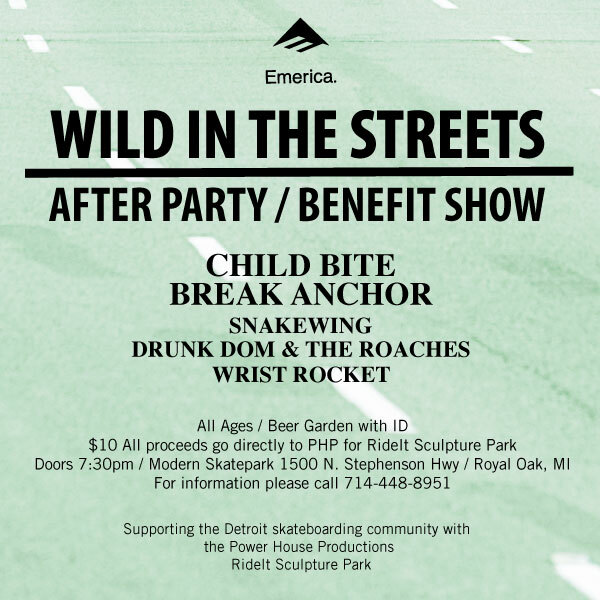 For Wild in the Streets 2012, Emerica has partnered with Power House Productions to benefit their neighborhood revitalization project, RideIt Sculpture Park. Power House Productions is an artist-run neighborhood-based nonprofit organization. Their mission is to develop and implement creative neighborhood stabilization strategies to revitalize and inspire the community. Their current project, RideIt Sculpture Park, is a do-it-yourself style skatepark built by skateboarders. The goal of the park is to create a space where neighborhood kids and adults can meet, play, create, build and exercise. Additionally, 100 artists will be creating/donating skateboards to be sold at the Good Wood Exhibition, a skateboard deck art fundraising online auction and show. The auction begins on May 19 and final bid date will coincide with the show, on May 26 at 10-22-9 in Hamtramck, MI. 100% of funds raised will go to the initial RideIt Sculpture Park build beginning early June. You can also contribute at crowdrise.com/rideit. For complete #WITS updates and info, visit Emerica.com/wildinthestreets.